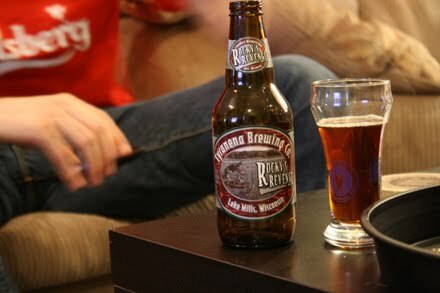 Hoosier Beer Geek: A Beer Blog for Indiana, from Indianapolis: KOTBR #103: Tyranena? I hardly knew her! KOTBR #103: Tyranena? I hardly knew her! 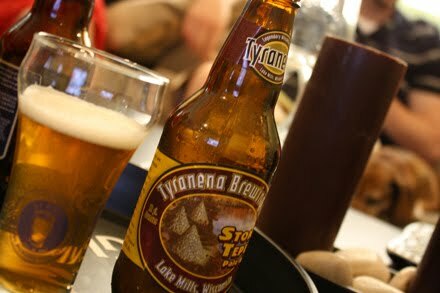 Tyranena is a brand new arrival to Indiana, showing up on shelves earlier this month. You may have sampled their Bitter Woman IPA or Rocky's Revenge at this year's Winterfest. They have rightfully earned their place among the top of Wisconsin's sea of craft breweries. We brought back a full selection of their offerings from Wisconsin only a few short weeks before their release in Indiana. It seemed incredibly timely for us to make our way through them all and let you know what we think. Because for some reason we think you care. 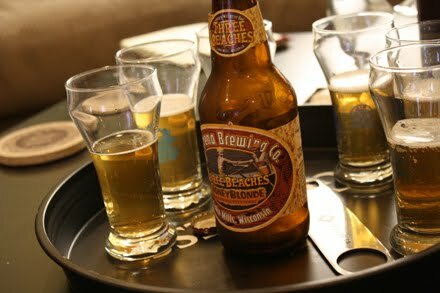 As you'd guess from the name, this beer is an American Blonde Ale brewed with honey. It pours with a pale golden color and a white fizzy head that dissipates almost immediately. The nose is bizarre, evoking bread, burnt hair, and sulfur. While that might sound unpleasant, the taste of the beer certainly is not. The flavor is grassy, grainy, and slightly sweet; it finishes with a touch of clover. Certainly a worthy warm-weather beer. 2.80 curds. 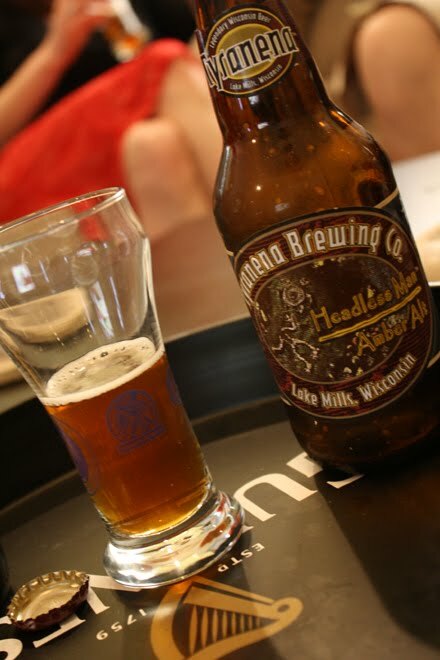 Headless Man is Tyranena's version of the Altbier style, which is a style that I wish more brewers would take on. It pours with a burnished copper color and a nice, off-white head. The nose carries noticeable biscuit notes and a faint whiff of toffee. 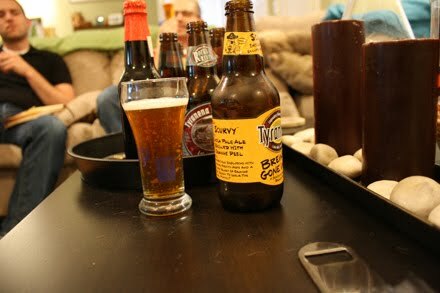 The consensus of the group was that the beer was predominated by a roasted nut flavor, with a good balance of caramel malts and moderate hop bitterness. 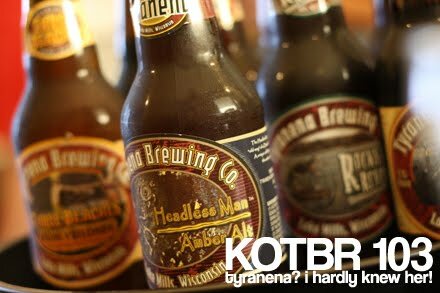 I really enjoy the Altbier style, and Headless man is a strong contribution to it. 3.28 curds. I was unable to find Tyranena's stone 'tepee" (which makes me think of Tepe, not Teepee - but that's for another time) but I did find the Daniel E. Krause stone barn which was very instrumental in the history of dairy farming in Wisconsin and is also made of stone. Fortunately that's not where the similarities stop with the Tyranena Stone Tepee Pale Ale and the Daniel E. Krause Stone Barn. Both are yellow in color (thanks to the fieldstone in the barn's case) and are lightly refreshing. The Stone Tepee is bitter and dry but light enough to be refreshing. This pale ale is very american in style and has a hint of grassy hops. A great beer to enjoy when you're out dairy farming. 2.9 cheese curds. 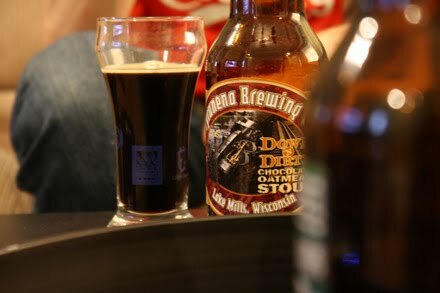 Much like the Don Q Inn up by the Wisconsin Dells the "Down and Dirty Chocolate Oatmeal Stout" can give you the perfect setting for a romantic weekend in Wisconsin. Pours dark and black, much like the color scheme of the vegas-style Casino Royale Suite. It has a nice roasted coffee nose with hints of chocolate evoking thoughts of arabian coffee (much like the swanky Arabian Nights Suite). The dark, thick, rich chocolatey stout reminds me of space and makes me think of blasting off in the Tranquility Base Suite that has a recreation of a Gemini Space Vessel! The smoky, roasted notes take me away, much like the Up, Up and Away Suite. Down and Dirty Chocolate Oatmeal stout may just be a beer, but it provides hours of enjoyment, just like the theme rooms at the down and dirty Don Q Inn. 3.9 cheese curds. Do you like euchre? If you're a good Hoosier, you surely do and so do the good people of Wisconsin. Personally, I learned to play in my hometown of Rochester, NY, where we were fond of the line "don't send a baby to buy the beer." You know what else you shouldn't do with a baby? Bring it to a beer tasting -- not if you want to taste all the beers, anyway. 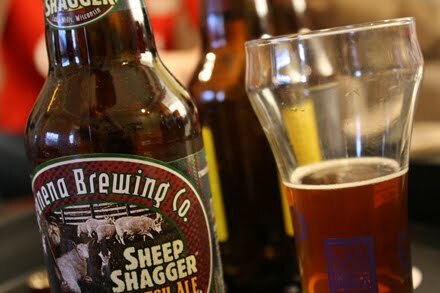 Sheep Shagger pours a surprisingly light brown color that belies the flavor packed into this beer. The nose offers coffee and chocolate and it's just slightly sweet in the mouth. You'll find more coffee, toffee and dark fruits in the flavor, with just a slight booziness -- enough to warm on the way down but not unpleasant at all.3.9 curds. Despite being basically just around the corner, I knew so little about Wisconsin. For example, did you know that Wisconsin was discovered by Ferdinand Magellan? It's true. Or that Wisconsin was once spelled Ouisconsin and pronounced "Oui-Oui-sconsin" by the French? Saw it on wikipedia. Absolutely true. I saw this Tyranena as a lesson. A lesson about Wisconsin. Having drank my way through most of their lineup now, I feel like I'm pretty much an expert. Consider the reviews below, which I did completely from memory, and I'd like to call "A Complete History of Wisconsin (abridged)". 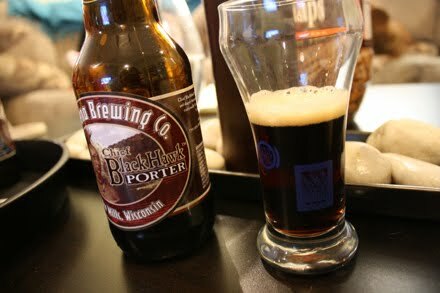 Chief Blackhhawk Porter has a deep black/brown color that echos the color of the clouds of bats that plague Wisconsin's Ice Age National Trail. Must like the trail, the porter starts with a smoky, almost ashtray like nose but follows up malty sweetness, light body, and dry smooth finish. Let's be honest, that's a pretty weird trail. I have no idea why they modeled a beer after it. 2.68 Curds. 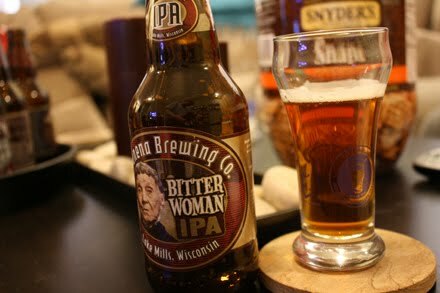 Bitter Woman IPA is named after Wisconsin's favorite son, Brett Favre. The beer is starts out yellow, but goes green for a little bit before it turns purple and really pisses everyone off. You can't blame the beer, though, because the beer just wants to win a Super Bowl. The beer doesn't know when to quit, either, and it strings everyone along every year and you have to just wonder about how a beer gets and ego that big. HELLO BEER, it's not 1996 anymore. Despite all that, Bitter Woman toes the line between American Pale and IPA, with an balanced agree-ability that suited my palate. 3.72 Curds. nice - I like how you were able to sample such a variety. I'm keeping my eyes peeled for some of their offerings... the scurby IPA is especially up my alley. someone pls. post it up if you know where to find some! Good to see Tyranena finally in Indiana. That's one of my favorites from Wisconsin.